Πατήστε τη φωτογραφία και δείτε όλες τις φωτογραφίες του The Hosteller Saket Delhi. American Express, Maestro, Visa, Other Cards, Euro/Mastercard. Featuring free WiFi and a sun terrace, The Hosteller Saket Delhi offers accommodation in Mahrauli. Some units have a seating area to relax in after a busy day. A terrace or balcony are featured in certain rooms. Each room includes a private bathroom. Common areas include a fully equipped kitchen and room with a flat screen TV. The nearest airport is Delhi International Airport, 11 km from The Hosteller Saket Delhi. 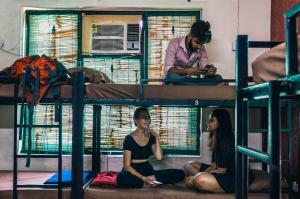 The Hosteller Delhi follows a 100% advance policy at the time of check-in. Please note that the property follows non-air-conditioned hours from 1100 hours to 2000 hours. During this time the common areas are air-conditioned for guests to lounge and relax. Please note that no non-resident visitor is allowed in the hostel beyond the reception area. At check-in, all guests must present a valid proof of identification and of on-going travel. All Indian citizens must carry a government authorized address Identification proof to be able to check-in at the property. All foreigners must carry and present their original passport along with a valid visa at the time of check-in. For Pakistani citizens, an additional residence permit letter from the High Commission of Islamabad is also mandatory for check in. At check-in, all guests must present a valid proof of identification and of on-going travel. Guests are required to show a photo identification and credit card upon check-in. Please note that all Special Requests are subject to availability and additional charges may apply. Please inform The Hosteller Saket Delhi in advance of your expected arrival time. You can use the Special Requests box when booking, or contact the property directly with the contact details provided in your confirmation.